Our award winning, UK based hosting services include two, highly featured packages. Our starter (Pro Home) package is great for anyone starting out or those looking to move from advert supported websites or blogs. Our professional (Pro Business) package is suitable for businesses and other organisations and with unlimited storage and bandwidth represents fantastic value for money. We also offer a Support & Maintenance add-on to our business hosting which includes back-ups, software updates, site monitoring, analytics and technical support (up to 3 minor edits per month) for a combined £250 + VAT per annum (£25 per month inclusive). 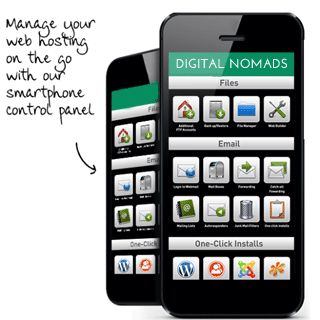 More details on the Digital Nomads Support & Maintenance Plan are here. Digital Nomads can also offer premium hosting including competitively priced VPS and dedicated server options. Our purpose built web hosting infrastructure is unrivalled in the UK for stability and reliability. Give UK visitors to your website a faster experience and benefit from an advantage in UK search engines. Quality UK based hosting with personalised customer support and great value packages including market leading, totally unlimited Pro Business. We believe in providing our customers with full ownership and control. Our web hosting control panel is one of the most advanced available today. Our web hosting is ideal for a beginner starting their first website through SME's to large organisations demanding their own powerful ecommerce solution. Our packages can be upgraded with a host of add ons to cater for your needs as your business or organisation grows. We take our customer's security very seriously and all software is upgraded within 24 hours of new patches being released. 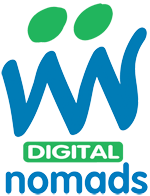 All websites situated in state-of-the-art secure UK data centre, manned 24/7 for peace of mind. We only use Dell servers in our web hosting platform. Our platform is designed to be highly redundant and all data is stored in network disk arrays.Data is automatically synchronised between the arrays so that in the event of an array failing the remaining array continues to serve data to the servers with no downtime. Each array is also backed up each night to a separate backup cluster which is then written to tape and stored offsite. 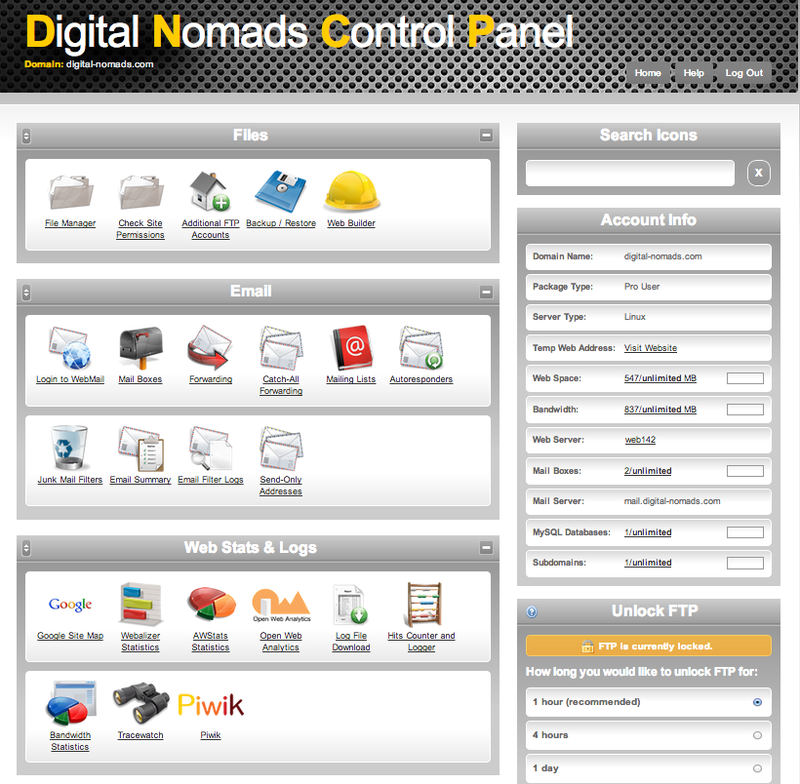 The Digital Nomads control panel provides you with all the tools you need to make the most of your hosting account. To ensure you never lose any of your work, backing up and restoring your website can all be done in just a few clicks with the files stored on your local machine. We offer great email functionality including forwarders and autoresponders. Set up multiple addresses and access via your email client of choice and keep everything synchronised across different devices including smartphones, with the use of IMAP. Also access your mail from anywhere over the web using one of the most powerful and flexible WebMail systems. 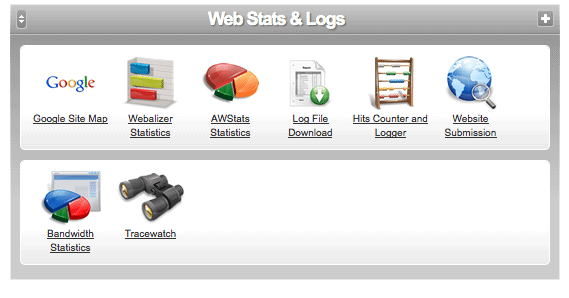 Check the performance of your website and automate the creation of a Google site map. Our ProBusiness hosting is fully ecommerce enabled and comes packed with advanced features and scripts. Our customers can choose to install as many scripts as they want from one of the UK's most comprehensive list of one click install scripts. We provide our hosting customers with one of the biggest CGI script libraries in the UK including one click install WordPress, Joomla, phpBB, BuddyPress, OpenX & Drupal. WordPress is arguably the most popular blogging and website software available today! 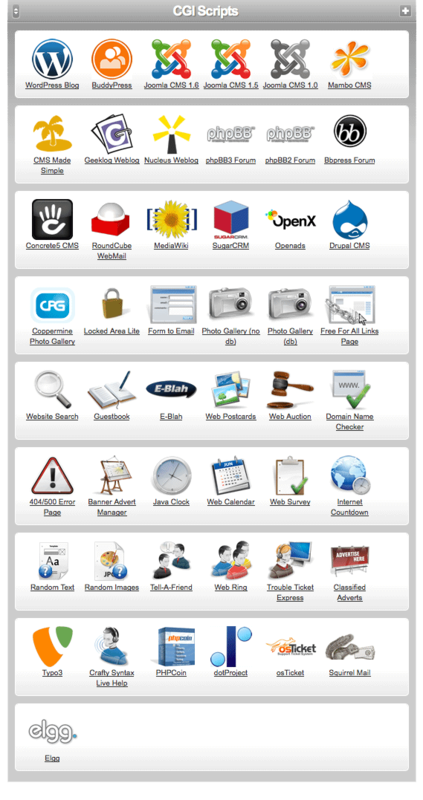 It is easy to install and use and will allow you to have a great looking site in minutes. BuddyPress is a WordPress social networking plugin that can be used to build a social network. A country code top level domain name. These domain names are associated with a country or geographic location, for example .co.uk (UK); .fr (France); and .cn (China). The ability to register these domain names from another country depends on the registrar's rules. For example, co.uk has no restrictions whereas .it (Italy) demands you are based in Europe. Uploading and downloading files to your web space is really easy and is often as simple as clicking, dragging and dropping. The process involved is called File Transfer Protocol (FTP). Don't be put off by the name, all this does is allow you to transfer files between your computer, where you can edit them, and your hosted server space, where people can access them over the web. Simple!For beginner's it is entirely possible to build a website using a script e.g. WordPress and to manage the content from within the platform chosen. To perform more advanced editing and customisation it sometimes becomes necessary to use FTP. Our hosting accounts include a security lockdown feature which you will have to open from within your online control panel, before you can access your files via this method. There are a number of FTP software solutions but the industry standard (which is free to download) is FileZilla. HTML (Hyper Text Mark-up Language) is the first layer of a web page and deals with the content (the text, any lists, tables, quotes etc.). MySQL (owned and developed by Sun Microsystems) is the world's most popular open source database. WordPress uses a MySQL database in addition to the WordPress core files.